Vince Rapisura, founder of Social Enterprise Development Partnerships, Inc. and microfinance and social entrepreneurship teacher at the Ateneo de Manila University, is FemaleNetwork.com's #FNRealDeal expert for the month of November. #FNRealDeal is a special FN series where field experts address the most pressing concerns of our 30-something readers, based on comments and feedback on social media and Girltalk. If there's any topic you'd like us to discuss (fashion and beauty, career, finance, travel, relationships) or any question you've always been afraid to ask, feel free to reach out to us via Facebook, or send an e-mail to female.network.editors@gmail.com with the subject "#FNRealDeal Question." Senders will remain anonymous. By now, you've been receiving your 13th month pay and/or your Christmas bonus for years. This expected windfall is always much-anticipated, and you probably already have plans for it way before you even check your ATM for exactly how much is coming in; but through all the years, have you managed to make this benefit work for you? Have you been making smart decisions, or have you been spending it on way too many things that aren't even necessary? Note that being money smart doesn't necessarily mean investing your cash in the first thing that you see. It's about knowing your priorities, managing them, and at the end of the day, still having enough to allow yourself the fruits of your labor. 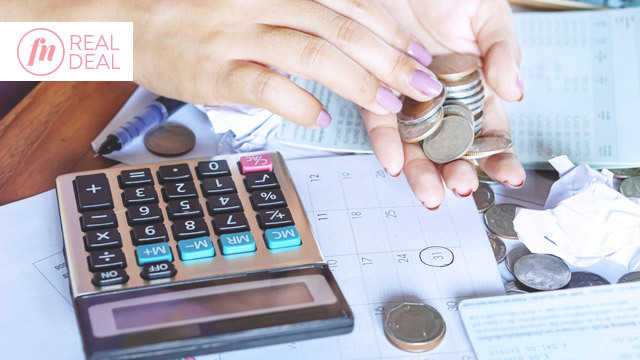 We recently asked financial expert Vince Rapisura a few questions regarding spending, saving, and investing your 13th month pay—in the end, it's all about what you find important, and how committed you are to these factors. What are the most common financial mistakes that people do with their 13th month pay and Christmas bonus? Vince Rapisura: The most common financial mistake is overspending and living like a one-day millionaire. People think that their 13th month pay or Christmas bonus is extra money they can spend and splurge on to coincide with the holidays. This leads to bad money habits and inappropriate financial priorities. To counter this, people should treat their 13th month pay or Christmas bonus as an extra boost to put their finances in order. It could be used to increase their emergency fund, purchase insurance coverage for protection, and further accumulate investments that generate passive income. It is important to put a balance in rewarding yourself and putting your 13th month pay or Christmas bonus to good use. As a personal rule, I spend half of my bonus to reward myself for the hardwork done and the other half is saved or invested. If you’re growing your wealth, is it better to put the extra cash in your savings account, to add it to your emergency fund (so you won’t touch your savings in case you suddenly need money), or to invest it elsewhere? VR: The point is not growing your wealth but WHY you want your wealth to grow. Your “why” will clarify what kind of financial products you ultimately need. My advice is to make a financial plan to prioritize your financial goals. With each financial goal, match this with appropriate financial products and strategies that will make your dreams come true. Is it wise to use your 13th month pay or Christmas bonus to pay of part of a bank loan? This is even more relevant if the loan attracts high interest rates such as credit card debts. It is more sensible to pay high-interest bearing loans using 13th month pay or Christmas bonus compared to stashing this in low yield savings accounts. Is it possible to pay off your SSS/PAGIBIG loans with your 13th month pay or Christmas bonus? If so, is it advisable? VR: As a general rule, we want to make the most of our money. For example, we can use our 13th month pay or Christmas bonus to open a savings account that would earn one percent per annum OR we can use these to pay off SSS/Pag-IBIG loans that charge us as much 12 percent per annum. In this case, paying the SSS/Pag-IBIG loans has greater economic advantage. So the answer is, yes! Is it advisable to invest in small franchises using your extra money? What are the pros and cons of doing so? VR: Although franchises are turn-key business models—meaning one does not have to start from scratch—there are still a three factors that need to be considered when investing in a small franchise. First and foremost, is your commitment to manage the small franchise; I have a lot of friends who tried this while keeping a full-time job and found themselves burnt out at the end of the day. The second factor is the product or service offering. This area is less of a concern since the franchise already got you covered on this one. The third factor that you need to consider is the viability of the market. Here, location is key. Are you at the right place so that you make your product or service available to your target market? If your answer is on the affirmative on all three factors, then yes, you can use your extra money in a small franchise. Otherwise, it is best to invest somewhere else. What other financial investments would you recommend to a career-oriented 30-something Pinay? VR: What I always say is, your investments should match your financial goals. We all have different dreams and that means different investment products that we need. As a guide, begin with asking yourself whether your financial goal is a need or a want. If it is a need, then that means that capital preservation is important—no elbow room for your money to fluctuate down. In this case, choose investment products that will preserve your capital such as time deposits, government bonds and Pag-IBIG savings. Also take into consideration your time horizon for investing; when do you need the money? This will aid you in choosing the investment product that will give you the most return given your investment horizon. Are there any financial tips you can give to help keep one’s 13th month pay and Christmas bonus intact and growing? - Make a financial plan. - Learn to save and invest. - Surround yourself with friends who have good financial habits.